White cabbage has always been the king of Russian vegetables and the farmers' pride and joy.... There is no market in Russia without sauerkraut, because for lack of cold storage facilities, up to two thirds of white cabbage ends up in barrels of sauerkraut. Every farmer's wife has her special secret recipe, so tasting when buying is a must. For every 220 pounds (100 kg) of white cabbage, 4.5 to 5.5 pounds (2 to 2.5 kg) of salt are usually spread over it in layers. The cabbage is firmly pounded and must sour for two to three weeks until the gas has escaped. Various additions determine the flavour. Carrots, apples, beet, raisins, celery, juniper berries, cranberries and blackberries are added to the cabbage, and also sometimes red pepper, vine or current leaves and dill seeds. As well as vitamin C, sauerkraut contains iron, calcium, lactic acid - which stimulates the intestinal flora - and easily digestible protein. 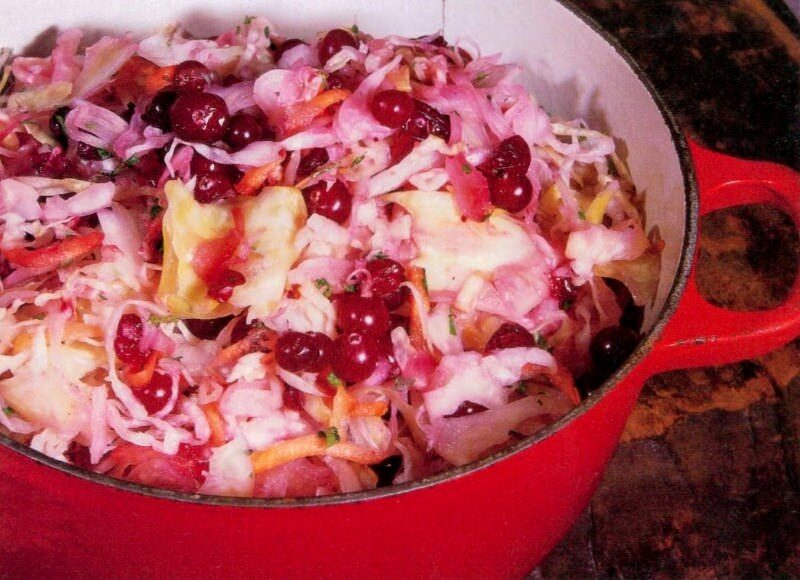 For homemade sauerkraut, you can use vegetables and fruits as well as cabbage. The white cabbage must be thinly shredded. Sauerkraut is produced by the fermentation of lactic acid. It contains a lot of Vitamin C and is therefore best eaten raw. It tastes food on its own, but you can dress it with sunflower oil and fresh berries. Give a wooden barrel a thorough wash and line it with cabbage leaves (alternatively, use a large stoneware pot that will hold at least 3 quarts (3 l). Put the shredded cabbage in another container, salting, mixing and pressing firmly with your hands, and adding the other ingredients as you go. Transfer this mixture into the barrel or pot in layers, pounding it down firmly after each layer. Make a few holes in the mixture with the handle of a wooden spoon, to allow the gases that form during fermentation to escape. Cover the top layer with one or two cabbage leaves and a clean cloth, place a plate with a weight (a stone or some cans) on top of it and leave it to stand at room temperature for 3 to 4 days, then store in a cool place. It is important for the fermentation of lactic acid that the cabbage is always covered in its own juices. The sauerkraut is ready to be eaten after 3 to 4 weeks. To serve, dress the sauerkraut with cold-pressed sunflower oil. Tip: Late varieties of white cabbage are best for pickling. They must be fresh, tightly closed and mild.